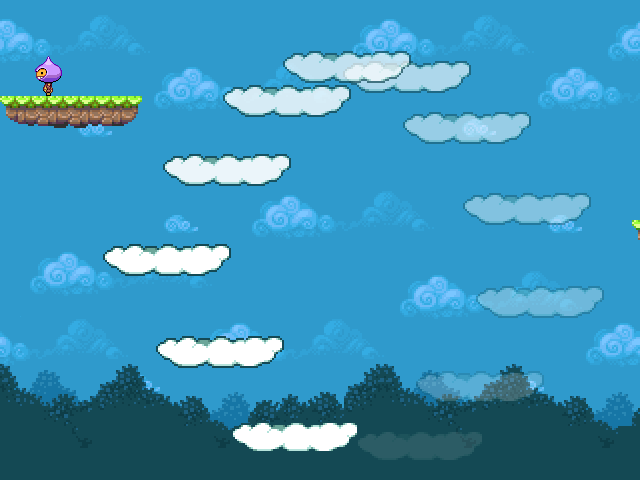 A “Cloud platform” is a special kind of platform in your level. It has two distinct characteristics: First it follows its own fixed motion path. And secondly, the player can ride it. It doesn’t have to look like an actual cloud of course! In the Mario games they take on all kind of visual forms, but it helps get the message across for our needs. You pass in the same parameters as if you were defining a normal Sprite. The difference is that it enables itself for physics, defines an anchor and sets some body properties up. As all CloudPlatforms need the same settings it saves some time to do this here. So far, so good. But they’re still just normal sprites. What we need now is to define their motion. Note how the coordinates are given as relative values, i.e. “+200” – this means they are all based off the platforms starting position. If you need to tweak the position you don’t have to redo all the motion values too. By default the CloudPlatform runs on a loop. So in the example above it moves down by 300 pixels (using Sine.easeIn) and then moves back up by 300 pixels as well. We test the velocity. If the player is in a jump and falling down (> 0) and not currently locked to a platform then we tell the game the player is now locked. The platform he landed on is stored in lockedTo and his velocity is reset. // Because preRender still runs even if your game pauses! The deltaX of the platform is added to the players x position. While its y position is adjusted to match the top of the platform (lockedTo.y). The -48 is just the height of the player sprite. 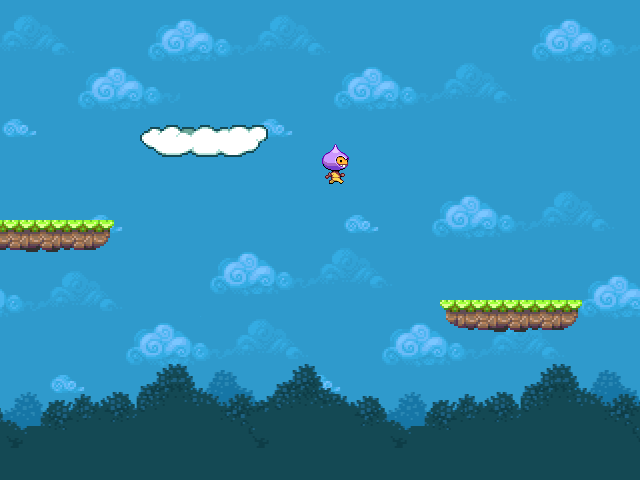 The player is still free to run around. But that all takes place as part of the update and postUpdate parts of the game loop. And in preRender we adjust him based on the platform he’s locked to. If the player walks off the side of the platform then we no longer consider them locked to it. Equally the jump function cancels the lock as well. This works well for specific case, but you may want to tailor this action for your needs. Run the code to play this demo. With the above values the background (i.e. the sky layer) will scroll slower than the trees. But both scroll slower than the actual camera does, giving a nice 3-way parallax effect as you traverse the level. * Rather than use the deltaX value you could drop an anchor when the player lands on the platform. Then adjust it as they move, but use its coordinate in preRender to re-position the player. This will give for a smoother end result as you won’t be dealing with floats and rounding. * Right now all the platforms start moving automatically, but they have a start method. You could activate this the moment the player lands on the platform, i.e. it moves on contact. * Equally the platforms don’t have to run on a loop. They could simply move from A to B and then stop. This requires careful level design, but is often seen in platform games. Posted on January 30th 2015 at 4:44 pm by Rich. When player is locked on the cloud platform, he is not locked acturally. Player may fall down from the platform. Is it a bug? how i can run this code using phaser 2.1.2 ?? ?